Our February Leading Lady Rosali is back for her sensational second performance! If you missed her smashing debut you must see it...CLICK HERE. 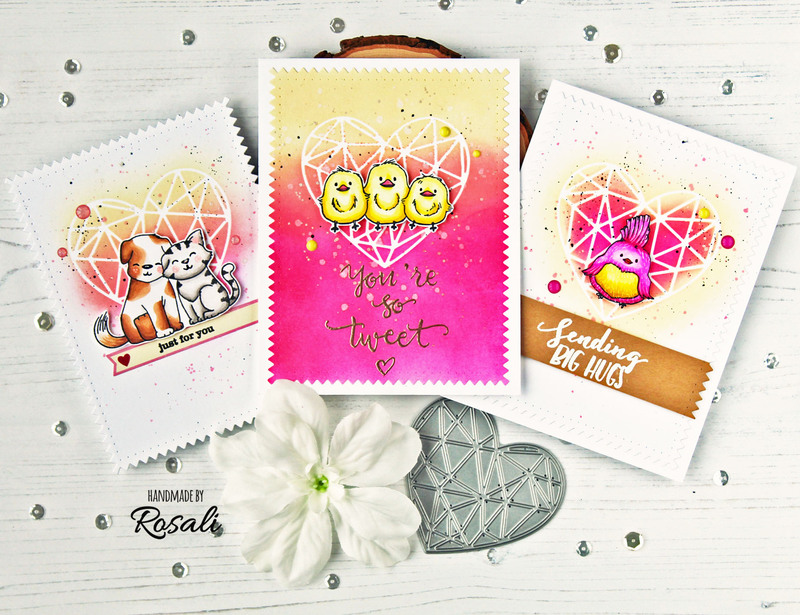 Today you will be wowed by Rosali's tremendous trio of cards! In honor of our birthday month we're doing something a bit different this year and including a challenge to you on each of Rosali's posts this month. See the end of this post for more details and to link up! I am very happy to be back on the blog with my second post as Winnie & Walter’s Leading Lady!! Using dies to die cut a mask for your background is an additional way to use stand-alone dies. I really like the seamless look you can get by doing this. And, another advantage is that it minimalizes layers on your cards and keeps them flat for easy and inexpensive mailing. I took a piece of masking paper and die cut it using the triangled True Multifaceted Heart Cutaway. By the way, I always use repositionable labels as masking paper as it comes in a large pack and works perfectly fine for me. I took the largest die from the Tilda Cutaways set (with the cool jagged edges) and die cut three backgrounds panels from Neenah Solar White cardstock. Then I adhered the die cut heart onto one of the panels and picked a yellow, peachy and pink ink pad from my stash. For the first card (yellow birdies), I inkblended the three inks all over the background panel going. 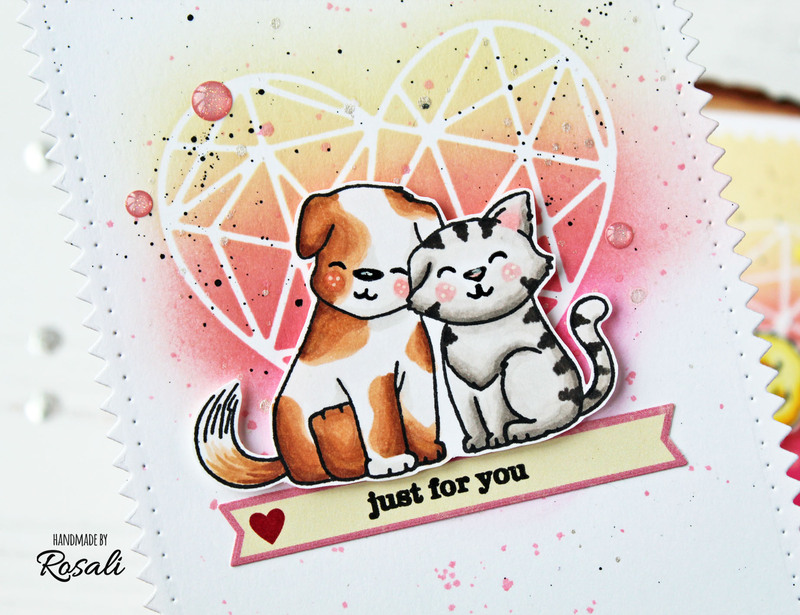 For the second card (dog & cat), I inkblended each color from left to right as well but just covered the heart and left the rest of the card white. For the third variation (pink birdie), I started inkblending pink ink in the center of the heart, and then added peach and yellow around it. After removing the mask from the last panel I added different splatters to all three backgrounds: tiny black watercolor splatters, pink ink splatters and Perfect Pearls splatters for some shimmer. 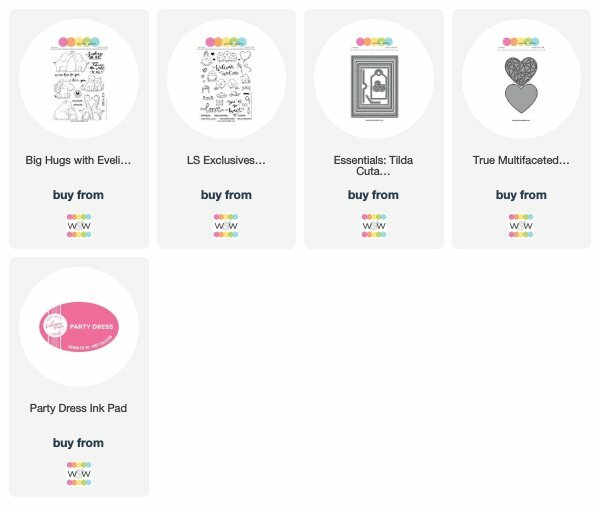 I picked three cute images from the So Tweet and Big Hugs stamp sets. Both sets are illustrated by Evelin T Designs and I just love all her critters! :-D I colored the images with Copic Markers, cut them out and adhered them over the hearts using foam tape. TIP 1: Use flicks from a white gel pen to get a feathery look - like I did on the pink bird. It's the same easy coloring technique that I used last week for the yeti's fur! TIP 2: Add a little bit of grey shading to the dog where his fur is supposed to be white. TIP 3: For the dog's light brown spots, first draw them in with the lightest E-marker. Then add shading from outer parts of the spots or where the shadows would be. For the sentiments I used “You’re so tweet” from So Tweet with Evelin T Designs stamp set and “Sending Big Hugs” and “just for you” from Big Hugs with Evelin T Designs stamp set. On the pink birdie card, I heat embossed the sentiment in white on a wider strip of kraft cardstock. I die cut that strip with the Tilda rectangle die to give it the same jagged edges as the card front. For the cat & dog card, I used a banner sticker from my stash for the sentiment. 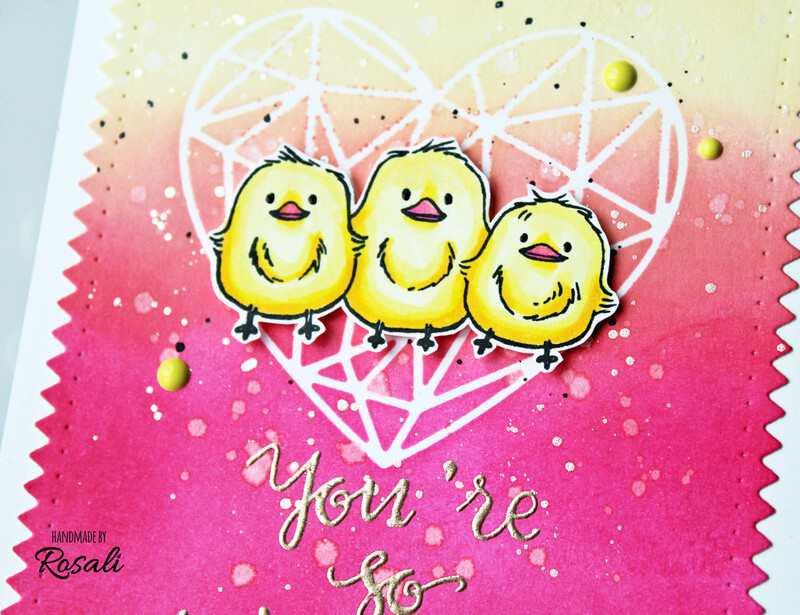 And for the yellow birdies card, I heat embossed the sentiment with shiny platinum embossing powder that matches the color of the Perfect Pearls splatters. I hope you like today's cards! For your chance to win a 30 $ gift certificate sponsored by Winnie & Walter, hop over to my blog post and leave me a comment over there, too. Now that you've seen Rosali do it, "Masking Backgrounds with Dies" to create your own project and link up here by Friday, March 15, 2019, 11:55 p.m. CST to be entered to win $50.00 credit to the w&w shop! One (1) lucky randomly chosen winner will be picked from each of Rosali's Leading Lady posts this month. These are just darling! I'm going to have fun playing along in this challenge! Love your darling cards. Your coloring is awesome. Cute set of cards and I like the masking technique. Rosali's cards are so beautiful and creative! I'll have to see if I can manage this technique and come up with a challenge entry myself! What a great & awesome tutorial!!! With this technique, you could use any die, background die, or even group like dies together & just spotlight certain areas. FANTA-BULOUS way to stretch your dies & supplies!!! I have loved your tutorials so far!! Very informative!!! WOW, I was impressed by the first weeks cards & these are even more amazing. Thank you for teaching me new techniques, your colouring is fabulous. I don't think I'm in league to enter the challenge yet though hehe. I LOVE LOVE LOVE your colors and the backgrounds! Just the cutest images and coloring! Awesome cards! Very nice ad I love them all! Your cards are so sweet!! I love the bright and happy colors! Wow! I'm in love for the bright colors!!! Beautiful cards!!! 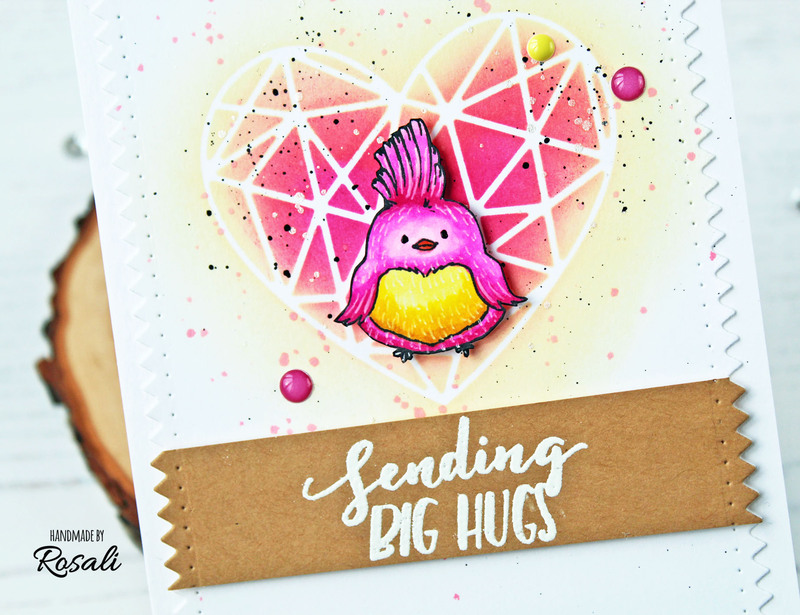 These die cuts are great backdrops for your focal point on each card. Thanks for sharing your creativity. I LOVE these pink cards!!! The heart backgrounds are so perfect for the sweet critters. Fab technique to try out!! LOVE your crisp, white faceted hearts, pretty ink blending and cute designs!